Directions.Q(6-10): Study the information carefully to answer the following questions. Note: Magazines were equally distributed among the distribution of respective printing presses. Press E prints magazines either in French or English language. If 1344 magazines printed in French language were distributed, how many magazines printed in English language were received by each distributor of Press E? What is the difference between the total number of magazines received by 4 distributors together of Press B and that by 6 distributors of Press D? 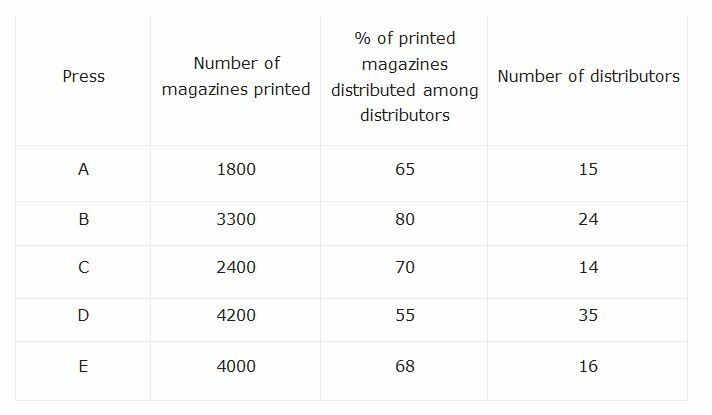 What is the average number of magazines not distributed by Presses A,B and C among their respective distributors? The number of magazines received by each distributor of Press A is what percent less than that of Press C? 5% of the magazines distributed by Press C and 10 % of the magazines distributed by Press D had minor printing mistakes. What is the respective ratio of number of magazines with minor printing mistakes distributed by Press C and that by Press D ?